The Movement for Peace with Justice and Dignity, MPJD sends greetings to you and your organization. We are a movement that emerged last year in response to widespread violence in Mexico stemming from the policies of the war against drugs and drug cartels. The 60,000 deaths, the 10,000 disappearances, and the 160,000 internally displaced people during the past six years is a tragedy caused directly caused by failed security policies. Importantly, only 2% of all crimes committed in Mexico are investigated and solved. We are dedicated to giving voice to the families of victims of this violence and to publicizing the real costs of this war. We have made it clear that the Mexican state must stop denying its responsibilities, which it does by criminalizing the victims of violence. Instead, it must accept that there are victims, and that it is the Mexican government’s responsibility to provide justice and reparations to them. With this in mind, we have asked for a change from the current security strategy to one focused on human security. To these ends, the Movement has organized two “caravans” that have traversed the North and South of Mexico. These actions prompted meetings with the President and Legislature to seek policy alternatives to war. These experiences have allowed us to see first-hand the grave situation we face as a society. As part of our quest for peace and justice, the Movement would like to extend to you a cordial invitation to be part of a new endeavor: the US Peace Caravan. 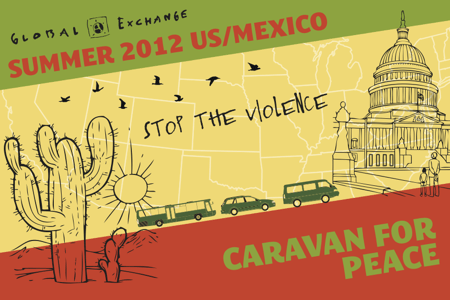 This caravan will leave this August from San Diego, CA and arrive in Washington, DC in September. This initiative seeks to promote dialogue with American civil society and its government regarding the following themes: the need to stop gun trafficking; the need to debate alternatives to drug prohibition; the need for better tools to combat money laundering; and the need to promote bilateral cooperation in human rights and human security in two priority areas: promotion of civil society and safety, as well as protection and safety for migrants. The MPJD seeks the support of the diverse array of groups we believe would be interested in promoting and end to, or alternatives to, the aforementioned policies. We believe that the solutions must emerge from within civil society and from a regional dialogue. For these reasons, we invite you to be our counterpart in an exercise of civilian diplomacy that can return peace, justice and dignity to the victims of this war. We hope we will be able to count on your valuable participation as an ally and partner in this historic event.